“Ok sweetie, Let’s do 2 more notebooks and one more folder. What color do you like best?” We’d been pushing our cart up and down the isles of the office supply section of the store for nearly an hour, selecting pencils, markers, post-it notes and binders. 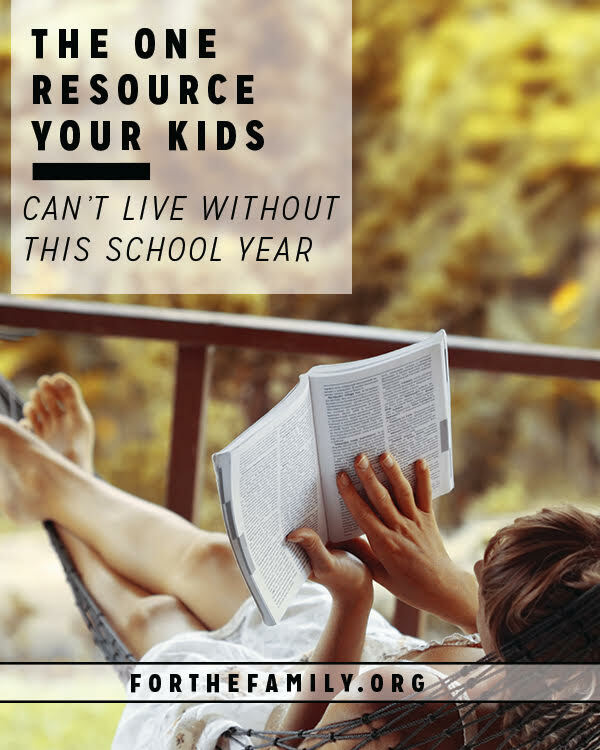 We had almost everything from our list and I was finally feeling prepared for the school year. And in the days that followed, as I filled out my new day planner I realized that this year… it was going to be a good one. Not only were our supplies in order, but our activities all seemed like the perfect fit- sports and classes to meet each one of my children’s personalities and interests were ready and waiting. But as I continued to pencil in our schedule, I started to add up all the driving, all the shuffling, and even all the homework hours, and I couldn’t help but wince. In planning our year, the one I felt so prepared for, I realized I’d neglected any time for me. That’s not unusual is it? Parents rush around, we chauffeur, we cheer and encourage and hold down the fort. But I couldn’t help but wonder how I would keep all that up, how I would always pour out without having time to fill up my own soul. The truth is, you are your child’s greatest resource. Your spiritual and emotional health will be a legacy they carry with them long after their love of soccer wanes, and well beyond the years of screeching out a tune on the violin. Beyond the freshly sharpened pencils and the notebooks filled with creative stories and spelling words, your children will reap the blessing of a parent who loves and cares for them from the depth of a spirit that is well watered, steeped in the wisdom and counsel of the Holy Spirit, God’s word, and a delight for all He has made. So, as you make your plans for your children this year, don’t forget your own heart too. Here are some questions to consider about how you can make a plan to begin pouring into your own life so that you can pour out to those you love. 1. When will you spend time in God’s Word? Will you rise early, or perhaps go to bed late? You may decide to slip away the afternoons to pray, or join your children in morning devotional reading. What ways do you want to grow in your relationship with God this year? What areas of your life will you bring to Him? 2. How will you grow in wisdom? What do you desire to learn? What books will you read? Maybe there is a class you’d like to take or a lecture you’d like to attend. Are there other friends who would join you in learning a new skill or taking up a new hobby? Could you host a book club or Bible study and commit to learning together with a group? 3. How will you care for your body this year? What are your goals for growing in strength and in health? Could you walk with a friend or with your family in the evenings? Take a cooking class or learn new recipes? Maybe this year is about learning how to rest, how to play and how to take deep breaths for you. Find a friend with similar goals and help to encourage one another! 4. How will you delight in life this year? Do you love to hike? To watch movies? Garden? What sights and smells bring a smile to your face? How can you bring more of what you love into your everyday? What do you find beautiful and how can you share it with others? Think about simple ways to bring loveliness into your home- display vases of wildflowers, light candles, enjoy the tastes of every season! 5. What do you need to say goodbye to? Are there drainers in your life that cause you stress? Are you over scheduled or simply trying to do too much? Consider what God has called you to (although it may be difficult!) and what you are holding onto yourself out of fear or guilt or habit. What can you let go of or say no to in this season so that you can say yes to what God has asked you to steward? As you make a plan for your own heart, be encouraged that you are not alone! Find a friend who is desiring to live intentionally and discuss these things together. Encourage one another to trust God in faith for the path He guides you in this school year. « Where Is God When We Face Disappointment?